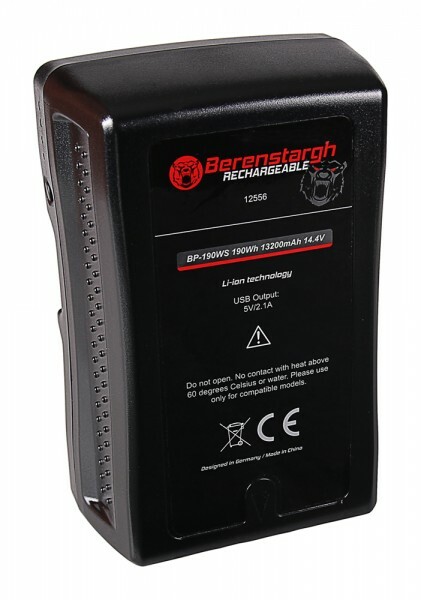 Product information "Berenstargh Battery f. Sony BP-190WS V-Mount"
The BERENSTARGH brand was developed specifically for the retail trade. The BERENSTARGH Li-Ion battery offers maximum capacity and endurance for your camera. High-quality brand cells, as well as cycle stability ensure longevity and low self-discharge even with rare use. BERENSTARGH batteries are 100% identical to the original battery and offer an excellent price-performance ratio! The BERENSTARGH batteries are developed under the strictest quality controls and have all the same electronic safety precautions as the original batteries. BERENSTARGH gives your camera the maximum POWER for long and beautiful photo experiences! With the purchase of a BERENSTARGH battery you will acquire an excellent, exquisite product which will convince you day after day. A dream for every hobby or professional photographer! Related links to "Berenstargh Battery f. Sony BP-190WS V-Mount"
Customer evaluation for "Berenstargh Battery f. Sony BP-190WS V-Mount"